So, you’ve made the big leap, and have created your own startup. Congrats! Let’s be real for a second though – getting your business off the ground can take a lot of investment, both in terms of time and money. We should know – even Giant Campus was a startup at one point! There are some aspects which are vital for an effective startup. Well managed finances and a product/service that meets people’s demands are a given when you want to get your brand out there. However, you’ll be glad to hear there are ways to help make the whole process easier, thanks to the magic of digital marketing. “Digital marketing? Doesn’t that just mean creating a website and having one of those Facebook thingies?” we hear you cry. But oh no – it’s so much more, and it can do a whole lot more for your startup. 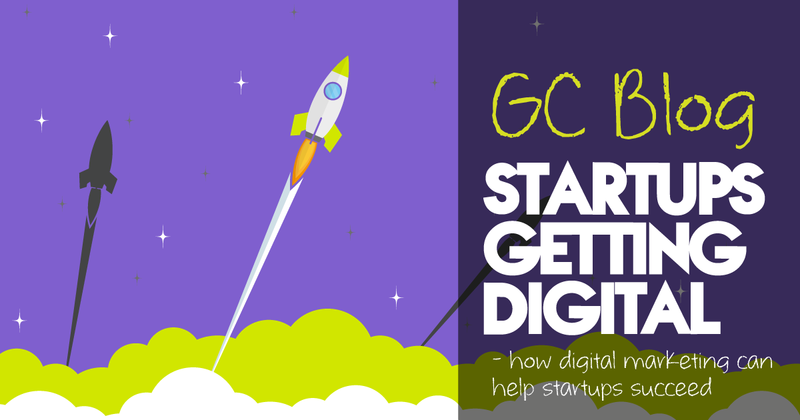 Take our hand as we guide you through the wonders of digital marketing, and how they can help your startup hit the ground running. Ever wondered how search engines like Google seem to show you the best websites for what you’re looking for? It’s not magic, it’s algorithms. Lots and lots of complicated algorithms that help Google and the like decide if your website is a good fit for what a user Is looking for. You don’t need to understand the technical aspects of how these algorithms work (phew), but you do need to know what they look for when deciding what makes a good website. That’s because having this knowledge can help get your startup’s own site to rank on that all-important front page of Google. Why is the first page so important? Well, think about it – when was the last time you looked beyond the first page of Google for something? Research shows the first page of search results receive almost 95% of web traffic, meaning if your startup isn’t sitting there, the majority of people are simply not going to see what you’re offering. Unfortunately, the exact intricacies of search engine algorithms are a closely guarded secret. On the flip side, digital marketers have done enough research over the years to have a pretty good idea of what search engines look for when deciding if a website is a suitable match or not. The keywords used, meta descriptions, the layout of your website, how fast your website loads and the number of high-quality backlinks are just a few of the things that can impact your startup’s ranking in search engines. It can take a bit of work, but it’s a surefire way to get people looking at your website. Ever noticed those links to sites on Google that sit above the normal search results on the page? Those are PPC ads, and they’re a great way to get your startup noticed and drive traffic to your site. Unlike SEO, PPC does require a bit of money to work. You set a budget, and everytime someone clicks on your ad you pay the host a set amount for the click – hence the name pay per click. The higher your budget, and the more you’re willing to pay per click can help ensure your ad sits at the top instead of your competitors. But don’t think you can win everything just by throwing money around. PPC ads are also ranked depending on how relevant the ad actually is to its audience. In Google, for example, each ad is given a rating between 1-10, known as a Quality Score. You can put as much money behind an ad as you want, but if it has a poor Quality Score it will almost certainly rank lower than a competitor with a higher score. “But what about all those ads I see on websites, how do I get my own ads to appear there?” Good question! Ads displayed on websites can appear through what is known as the Google Display Network; a collection of millions of websites that businesses can use to place their ads. This form of PPC is also a great way to drive traffic because you can place your ads on specific websites that are related to what you’re trying to sell. For example, if you run a website that sells coffee, you could place an ad for your shop on a coffee blog, to be sure that people who see your ad are likely coffee enthusiasts themselves. What’s more, if you owned a physical coffee shop as well, you could make your ad only appear to people who live in the area, to entice them to come and visit. How cool is that? Facebook, Twitter, Instagram, LinkedIn… they likely need no introduction. The current kings of social media aren’t going anywhere, which is good news for businesses looking to use them to help promote their startup. There’s no excuse not to be on social media these days. They’re easy to set up and provide access to an audience in their billions. That’s a lot of people. But that also means there’s a lot of competition too. To get your startup to stand out on social media, you need to be putting out relevant and interesting posts that people are going to want to see. That means more than just shoving your newest product or service down people’s throats at any given chance. Promoting conversations, sharing helpful original content, and interacting with users can help establish your startup as a brand that cares for its customers, rather than one simply looking to make a quick sale. In the digital marketing world, content really is king. If you’re able to put out great original content on your site, you can not only bring people to your site – but keep them coming back for more. Crafting content can be difficult at times, and there’s certainly an art to it, but don’t let that discourage you from giving it a shot. One thing to bear in mind is that you want to try and write something that will help solve a problem faced by a potential customer, giving them valuable information that can make their life easier. If you can help solve someone’s issue, they will be more likely to trust you and your brand – which in turn can help secure that all important sale. A quick bit of advice, if you’re looking to make content that’ll help customers and drive traffic to your site, then why not use Answer The Public, a tool that will suggest content ideas based on what people are searching for themed to your product or service. So yes, there’s a lot of things to think about and get stuck into within the digital world, but you’re not alone. Doing it for yourself as a startup is a great way to get things off the ground, and then one day you’ll be able to afford an agency to do it for you if that’s what you want. But for now, upskill yourself and your team. Our digital marketing courses and workshops are a great way to get started, as well as providing ongoing support after your session so you never have to be stuck on something technical. All of those things mentioned above, we’ve got a course for. And if you want something super tailored to your business goals and objectives, then we’re happy to build a course around you in a bespoke kinda way. Check out our digital marketing workshops or get in touch to see what we can do for you to help your startup make the most of digital marketing.